“This is the first ‘Unto Every Person There is a Name’ ceremony in which my father-in-law, Shmuel Ben-Artzi, is not listening to the reading of the names. He passed away last November. He used to listen to the reading of the names. He thought that this was the way to give expression to the souls that were lost. He saw the loss as both a personal and national thing, the dimensions of which can scarcely be described. He came to the country when he was 18, from the town of Bilgoraj in Poland, despite the strong opposition of his father. He was sent as an outstanding student of the Novardok yeshiva in order to open a branch here in Bnei Brak. He soon went to the orchards and decided that he had to redeem the soil of the Land of Israel; he worked in the orchards for seven years. Afterwards, he became a teacher in Tiberias. He was a great teacher, a leading educator. He held a Bible study class for adults for 30 years, for the same people for 30 years. He was a major Bible researcher but he was also a poet. In his poetry, he expressed the love for the Land of Israel, for the [Jewish] People, for people and for nature. But above all, in his poetry, he expressed his pain, personal and national, over the Holocaust. His father, Moshe Hahn, his father’s wife Ita, his twin sister Yehudit, who was 24. His brothers Meir Hahn (18), Shimon Tzvi (16) and Aryeh Leib (13), and his little sister Feizele. His aunt Ma’tel Koenigstein, her son Hillel and her eldest daughter. His uncle Mendel, his wife and their two children. His uncle Avraham Tauber, his wife and their son and daughter. His aunt Rachel Tauber and her three sons – Avraham, Yaakov and Shlomo, and their wives and children. His aunt Hinda and her husband Yehezkel. His aunt Hendel, her husband and their children. His aunt Paula and her two daughters. חשב שזאת הדרך לתת ביטוי לנשמות שהלכו לאיבוד. הוא ראה את האובדן כדבר אישי ולאומי במימדים שקשה לתאר. הוא עלה לארץ בגיל 18 מהעירייה בילגוראיי בפולין חרף התנגדותו העזה של אביו. הוא נשלח כעילוי על ידי ישיבת נוברדאו לפתוח סניף כאן בבני ברק. מהר מאוד הוא הגיע לפרדסים והחליט שעליו לגאול את אדמת ארץ ישראל, ולכן הוא עבד 7 שנים בפרדס. לאחר מכן הפך למורה בטבריה. הוא היה מורה גדול, מחנך דגול. הוא קיים חוג ללימוד תנ”ך של מבוגרים במשך 30 שנה, 30 שנה אותם אנשים. הוא היה חוקר תנ”ך גדול, אבל הוא גם היה משורר. בשירתו ביטא את אהבת הארץ ואהבת העם ואהבת האדם ואהבת הטבע שלו, אבל מעל הכל הוא ביטא בשיריו את הכאב שלו, האישי והלאומי על השואה. אני מבקש להקריא לכם אחד משיריו שנקרא ‘חלום לזכר עיירתי בילגוראיי’. בית אבא עדיין עומד על תילו. טבעו של הסתיו בפולין הוא בכך. בשביל סוכתנו נושאים אנו סכך. הערב הגשם לבוא לא יהין. לשווא עוד חיפשתי סוכת השלום. אחי את עומסו לי השאיר – ואיננו. לבד שם בכיתי עד סוף החלום”. אביו משה הון, אשתו של אביו, איטה הון אחותו התאומה של חמי, יהודית בת משה הון, בת 24. האחים מאיר הון, בן 18, שמעון-צבי הון, בן 16, אריה לייב הון, בן 13, ואחותו הקטנה פייזלה הון, בת 10. דודתו מאטל קניגשטיין ובנה הלל בן יחזקאל ובתו הבכורה, והדוד מנדל הון, אשתו ושני ילדיהם. הדוד אברהם טאובר, אשתו, בתו ובנו, הדודה רחל טאובר ושלושת בניה – אברהם, יעקב ושלמה, נשותיהם וילדיהם. הדודה הינדה ובעלה יחזקאל. הדודה הנדל, בעלה וילדיהם. הדודה פאלה ושתי בנותיה. 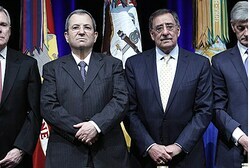 U.S. Defense Secretary Leon Panetta, Defense Minister Ehud Barak, attend ceremony in honor of Yom Hashoah at the Pentagon. The Pentagon held a ceremony on Thursday in honor of Yom Hashoah, the Holocaust Remembrance Day. The ceremony was attended by U.S. Defense Secretary Leon Panetta. “Today we pause to remember and honor 6 million souls who were murdered not because of anything they had done, but because of who they were,” Panetta said during the ceremony, according to a statement released by the U.S. Department of Defense. He said he helped to establish Yom Hashoah as a U.S. observance while serving in the House of Representatives in 1980. He added that the day is He nHe aHis uiisalso an occasion to remember survivors of the Holocaust. “They bore witness to evil and to tragedy, and in their strength we all find inspiration – inspiration to fight against the intolerance and indifference that allowed all of this to happen,” said Panetta. The program included an appearance by guest speaker Charlotte Schiff, the sole member of her family who survived the Holocaust. Panetta said Schiff has dedicated her life to making sure those who perished in the Holocaust are never forgotten. “It is our honor to affirm to you that we will never stop fighting in the memory of those who perished – fighting for a better future, [and] fighting for a world safe from aggression, from tyranny and from injustice,” he told Schiff. I met Hanoch Mandelbaum, an 89-year-old survivor of Bergen-Belsen. Shortly after he came to Israel, as a young carpenter, he helped construct the desk upon which Ben Gurion signed the Declaration of Independence. That is MiSho’a liTkuma – from holocaust to resurrection. And I met Elisheva Lehman, an 88 year-old Holocaust survivor from Holland, who was a music teacher. I asked Elisheva if she would play something for us and she did. She enthusiastically played “Am Yisrael Chai” and we all sung together. It was quite emotional. Our enemies tried to bury the Jewish future, but it was reborn in the land of our forefathers. Here, we built a foundation for a new beginning of freedom, hope, and creation. Year after year, decade after decade, we built the foundations of our country, and we will continue to yearly strengthen the pillars of our national life. On this day, when our entire nation gathers together to remember the horrors of the Holocaust and the six million Jews who were murdered, we must fulfill our most sacred obligation. This obligation is not merely an obligation to remember the past. It is an obligation to learn its lessons, and, most importantly, to apply them to the present in order to secure the future of our people. We must remember the past and secure the future by applying the lessons of the past. This is especially true for this generation – a generation that once again is faced with calls to annihilate the Jewish State. One day, I hope that the State of Israel will enjoy peace with all the countries and all the peoples in our region. One day, I hope that we will read about these calls to destroy the Jews only in history books and not in daily newspapers. Today, the regime in Iran openly calls and determinedly works for our destruction. And it is feverishly working to develop atomic weapons to achieve that goal. I know that there are those who do not like when I speak such uncomfortable truths. They prefer that we not speak of a nuclear Iran as an existential threat. They say that such language, even if true, only sows fear and panic. I ask, have these people lost all faith in the people of Israel? Do they think that this nation, which has overcome every danger, lacks the strength to confront this new threat? Did the State of Israel not triumph over existential threats when it was far less powerful than it is today? Did its leaders have any qualms about saying the truth? David Ben Gurion told the people of Israel the truth about the existential dangers they faced in 1948 when five Arab armies tried to snuff Israel out in its cradle. Levi Eshkol told the people of Israel the truth in 1967 when a noose was being placed around Israel’s neck and we stood alone to face our fate. And when they heard these truths, did the people of Israel panic or did they unite to thwart the dangers? Were we paralyzed with fear or did we do what was necessary to protect ourselves. I believe in the people of Israel – and this belief is based on our experiences. I believe that the people of Israel can handle the truth. And I believe that they we have the capability to defeat those who seek to harm us. Those who dismiss Iran’s threats as exaggerated or as mere idle posturing have learned nothing from the Holocaust. But we should not be surprised. There have always been those among us who prefer to mock those who tell uncomfortable truths than squarely face the truth themselves. That is how Zev Jabotinsky was received when he warned the Jews of Poland of the looming Holocaust. But the leading Jewish intellectuals of the day ridiculed Jabotinsky, and rather than heed his warning, they attacked him. I know there are also those who believe that the unique evil of the Holocaust should never be invoked in discussing other threats facing the Jewish people. To do so, they argue, is to belittle the Holocaust and to offend its victims. I totally disagree. On the contrary. To cower from speaking the uncomfortable truth – that today like then, there are those who want to destroy millions of Jewish people – that is to belittle the Holocaust, that is to offend its victims and that is to ignore the lessons. Not only does the Prime Minister of Israel have the right, when speaking of these existential dangers, to invoke the memory of a third of our nation which was annihilated. It is his duty. There is a memorable scene in Claude Lanzmann’s documentary Shoah that explains this obligation more than anything. In the harsh existence in the Warsaw Ghetto, Leon Feiner of the Bund and Menachem Kirschenbaum of the General Zionists met with Jan Karski from the Polish World War II Resistance Movement. Jan Karski was a decent, sensitive man, and they begged him to appeal to the conscience of the world against the Nazi crimes. They described what was happening, they showed him, but to no avail. Seventy years ago the Jewish people did not have the national capacity to summon the nations, nor the military might to defend itself. Today we have an army. We have the ability, the duty and the determination to defend ourselves. As Prime Minister of Israel, I will never shy from speaking the truth before the world, no matter how uncomfortable it may seem to some. I speak the truth at the United Nations; I speak the truth in Washington DC, the capital of our great friend, the United States, and in other important capitals; And I speak the truth here in Jerusalem, on the grounds of Yad VaShem which are saturated with remembrance. על ההר הזה התרחש היום אסון כבד. כפי שאמר נשיאנו, איבדנו היום קצינה צעירה ומבטיחה, הילה בצלאלי זיכרונה לברכה, ואיבדנו חייל בהנדסה קרבית שליבו נדם. אנו שולחים את תנחומינו כאן למשפחות ואנחנו שולחים גם את איחולי ההחלמה, החלמה מהירה לפצועים. מכובדי, נשיא המדינה שמעון פרס, יושב ראש הכנסת ראובן ריבלין, נשיא בית המשפט העליון השופט גרוניס, שרים, חברי כנסת, יושב ראש הנהלת יד ושם אבנר שלו, יושב ראש מועצת יד ושם הרב ישראל לאו, הרב הראשי לישראל הרב יונה מצגר, הרב הראשי לישראל, הראשון לציון, הרב שלמה עמאר. ראש עיריית ירושלים ניר ברקת, אנשי סגל א’ וזקן הסגל הדיפלומטי, שגריר קמרון בישראל. ניצולי שואה מהארץ ומן העולם, חסידי אומות העולם ומשפחותיהם. קציני וחיילי צה”ל, מפקדי ושוטרי משטרת ישראל, קהל נכבד. אתמול בבוקר ביקרתי בבית אבות שבו מתגוררים ניצולי שואה. פגשתי שם את עידית יאפּוֹ, אישה מדהימה, היא בת 104, צלולה, חדה. עידית נמלטה מגרמניה זמן קצר אחרי שהיטלר עלה לשלטון ב-1934. פגשתי את אסתר נדיב, בת 89, אחת מתאומי מנגלה, במקרה הזה תאומות. עידית סיפרה לי בעיניים בורקות, תוך כדי שהיא קוראת ספר, ביוגרפיה של גולדה מאיר, היא אמרה ‘אני כל כך גאה, אני כל כך גאה להיות חלק מהמדינה שלנו, המדינה המתפתחת שלנו’. פגשתי שם את חנוך מנדלבאום, ניצול ברגן-בלזן, בן 89. זמן קצר אחרי שהוא הגיע לארץ, הוא עזר כנגר צעיר לבנות את השולחן שעליו חתם בן-גוריון על מגילת העצמאות. ממש משואה לתקומה. פגשתי גם את אלישבע להמן, ניצולת שואה בת 88 מהולנד, שהייתה מורה למוסיקה. שאלתי את אלישבע אם היא מוכנה להשמיע לנו קטע נגינה והיא נענתה ברצון, אפילו הייתי אומר בשקיקה. היא ניגנה. היא ניגנה “עם ישראל חי”, ואנחנו כולנו שרנו יחד בהתרגשות גדולה. גבירותיי ורבותיי, עם ישראל חי. אויבינו ניסו לקבור את העתיד היהודי, אבל עתידנו נולד מחדש בארץ אבותינו. כאן בנינו בסיס להתחלה חדשה של חופש ותקווה ויצירה. שנה אחרי שנה, עשור אחר עשור, יצקנו וביססנו את יסודות מדינתנו, ונמשיך לחזק מדי שנה את עמודי התווך של חיינו הלאומיים. ביום הזה, היום שבו העם כולו מתכנס יחד כדי לזכור את מוראות השואה ואת ששת המיליונים מבני עמנו שנרצחו בה, עלינו לממש חובה עליונה. והחובה זו איננה רק לזכור את העבר, אלא גם ללמוד את לקחיו, והחשוב ביותר – ליישם לקחים אלה, וזאת כדי להמשיך ולהבטיח את עתיד עמנו. זה כתוב פה מאחוריי, זוכרים את העבר, מבטיחים את העתיד, על ידי יישום לקחי העבר. והדבר זה נכון במיוחד לדורנו שעומד שוב בפני הקריאה להשמיד את מדינת היהודים. ידידיי, אני מקווה שיום אחד מדינת ישראל תחיה בשלום עם כל העמים וכל המדינות באזורנו. אני מקווה שיבוא יום שבו נלמד על הקריאות להשמדת ישראל בשיעורי ההיסטוריה בלבד ונפסיק לשמוע אותן בתקשורת היומיומית. אבל היום הזה טרם הגיע. כיום קורא ופועל המשטר האיראני בגלוי ובנחרצות להשמדתנו. והוא פועל בקדחתנות לפתח נשק גרעיני כדי להשיג מטרה זו. עכשיו, אני יודע שישנם אלה שאינם אוהבים שאני אומר אמיתות לא נוחות מסוג זה. הם מעדיפים שלא נדבר על איראן גרעינית כאיום קיומי. הם טוענים שאמירה כזאת, גם אם היא נכונה, רק זורעת פחד ובהלה. אני שואל, האם האנשים האלה איבדו כל אמון בעם ישראל? האם הם באמת חושבים שלעם הזה, שהתגבר על כל סכנה, אין מספיק כוחות כדי להתמודד עם סכנה חדשה זו? הרי מדינת ישראל התמודדה בהצלחה מול סכנת קִיוּמִיוּת כשהייתה לאין ערוך פחות חזקה ממה שהיא היום, ואני חייב להגיד שמנהיגיה לא היססו לומר לעם את האמת. דוד בן-גוריון אמר לעם את האמת לגבי הסכנה הקיומית שעמדה בפנינו. הוא אמר את זה ב-1948, כשחמשת צִבְאוֹת-ערב ניסו להשמיד את מדינת ישראל שזה עתה נולדה. לוי אשכול אמר לעם את האמת ב- 1967, כשעניבת החנק הלכה והתהדקה סביב צווארה של ישראל, ועמדנו לבד לגורלנו. וכשהעם שמע את האמת, האם הוא נתקף בבהלה, או שהוא התאחד כדי להדוף את הסכנה? האם הפחד שיתק אותנו, או שעשינו את מה שהיה נחוץ כדי להגן על עצמנו? אני מאמין בעם ישראל, והאמונה שלי איננה אמונת סתם, היא מבוססת על ניסיון חיינו. אני מאמין בכוחו של עם ישראל להתמודד עם האמת. אני מאמין בכוחנו להגן על עצמנו מול מבקשי נפשנו. אנשים שמבטלים את האיום האיראני כגחמה או כהגזמה לא למדו דבר מהשואה. אין זה חדש. תמיד היו אנשים בקרבנו שהעדיפו ללגלג על אלו שאומרים אמיתות לא נוחות, מאשר להתמודד עם האמת כפי שהיא. כך נהגו כלפי ז’בוטינסקי, כשהזהיר את יהודי פולין מפני השואה המתקרבת. כי אתם טרודים ובהולים בדאגות היום-יום. האזינו לדבריי, למען השם. הזמן קצר”. הוגי דעות מובילים בקרב עמנו באותה העת זלזלו בדברים הללו של ז’בוטינסקי, ובמקום להקשיב לאזהרתו הם תקפו אותו. הנה מה שאמר עלי אז אחד הסופרים המוכשרים של עמנו: “מה שז’בוטינסקי עושה עתה בפולין עובר כל גבול. הודעתו מזיקה לציונות ולאינטרסים החיוניים של עמנו. אוי לאומה שאלה הם מנהיגיה”. אני יודע שישנם אנשים שמאמינים שאסור להזכיר את הרוע הייחודי של השואה כשמדברים על האיומים העכשוויים שעומדים בפני העם היהודי. הם טוענים שלעשות זאת משמעו לזלזל בשואה ולהעליב את קורבנותיה. אני שולל לחלוטין גישה זו. להיפך, להירתע מלומר את האמת – שהיום כמו אז ישנם אלה שרוצים להשמיד מיליוני יהודים – זה זלזול בשואה, זה עלבון לקורבנותיה, זו התעלמות מלקחיה. לראש ממשלת ישראל לא רק מותר להעלות את זכר השמדת שליש מעמנו כשהוא מדבר על סכנות קיומיות לעמנו, זוהי חובתו. יש קטע בלתי נשכח בסרט הדוקומנטרי של קלוד לאנצמן – “שואה”, שמבהיר את הסיבה לחובה הזו יותר מכל. בימים הקשים של גטו ורשה, נפגשו ליאון פיינר מהבונד ומנחם קירשנבוים מהציונים הכללים עם נציג המחתרת הפולנית, יאן קארסקי. קארסקי היה איש הגון, איש רגיש. הם התחננו בפניו שיזעיק את מצפון העולם נגד הפשעים הנאצים. הוא תיארו לו, הראו לו את הדברים הנוראים, אך ללא הועיל. והם אמרו לו: עזור לנו, אין לנו מדינה שלנו, אין לנו ממשלה, אין לנו אפילו קול בין העמים. והם צדקו. לפני שבעים שנה לא הייתה לעם היהודי לא היכולת המדינית להזעיק את האומות ולא היכולת הצבאית להגן על עצמו. אבל היום ברוך השם המציאות שונה. היום יש לנו מדינה, היום יש לנו צבא. יש לנו היכולת, החובה והנחישות להגן על עצמנו. כראש ממשלת ישראל לעולם לא אירתע מלומר את האמת לאומות, גם כשאמת זאת איננה נוחה. אני אומר את האמת באו”ם, אני אומר את האמת בוושינגטון, בירת ידידתנו הגדולה ארצות הברית, וגם בבירות חשובות אחרות, ואני אומר את האמת כאן בירושלים, על האדמה רווית הזיכרון של יד ושם. ואמשיך לומר את האמת לעולם, אבל בראש ובראשונה לעמי, שאני יודע שהוא חזק דיו כדי לשמוע את האמת. האמת היא שאיראן חמושה בנשק גרעיני, היא איום קיומי על מדינת ישראל. האמת היא שאיראן גרעינית מהווה איום מדיני גם על מדינות אחרות באזור ואיום חמור על השלום העולמי. והאמת היא שחובה למנוע מאיראן להשיג נשק גרעיני. זוהי חובתו של העולם, אבל מעל לכל זוהי חובתנו. זיכרון השואה איננו רק עניין טקסי, זה איננו רק עניין של זיכרון היסטורי. זיכרון השואה הוא ציווי מעשי להפיק את לקחי העבר, כדי להבטיח את אושיות העתיד. לעולם לא נטמון את ראשנו בחול. עם ישראל חי. ונצח ישראל לא ישקר. Thousands of events and ceremonies will take place in Israel on Thursday, Holocaust Memorial Day. Thousands of events and ceremonies will take place in Israel on Thursday, Holocaust Memorial Day. After a siren sounds at 10 AM – at which time Israelis stand at attention, reflecting on the tragedy of the destruction of European Jewry in the Holocaust – events will be held in schools, synagogues, IDF bases, at Yad Vashem, and many other venues. The main ceremony at Yad Vashem will take place at 1 PM, while Knesset members will take turns reading out the names of the victims. Youth groups will gather at Yad Vashem for a special ceremony later in the afternoon, and the day will be capped by memorial ceremonies at Yad Mordechai, named for the Warsaw Ghetto hero, and Kibbutz Lochamei Hageta’ot [kibbutz named for Ghetto fighters, ed. ],Thursday evening. 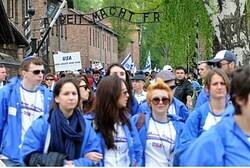 In Europe, meanwhile, some 18,000 Jewish youths and adults will participate in the March of the Living, a trek which brings participants from the death camps of Poland and Germany, to Israel, where they will arrive in time for Independence Day next week. Leading the March, among others, are Rabbi Yisrael Meir Lau, Tel Aviv’s Chief Rabbi, and Israel Police Commander Yochanan Danino. Among a delegation of police attending the March are a number of officers whose parents are survivors. Among the student groups attending is one from Turkey. The delegation consists of two members 17 and 18 years old respectively. They asked that their names not be published, given the tense situation in their homeland, but they said that visiting the concentration camps was a very moving experience for them, despite the fact that their families, living in Turkey, did not experience the Holocaust firsthand as did the families of most participants in the March. “On my way here, the glowing lights of Jerusalem were suddenly replaced by the sparks of fire which once consumed my people. This is us. This is our people, a people of illumination, an orphan people. This is us. Holocaust survivors, builders of resurgence, my brothers and sisters, tonight our tearing eyes turn to those who are not here with us, and our wide opened eyes gaze upon the yet to come. During the holidays I travelled all over the country. Blue skies, blooming fields, lovely children, hard-working people. I wondered about the communities they originated from which are no longer. For a moment, I replaced Tel Aviv with Vilna, Haifa with Bialystok, Dgania, Nahalal, Beer-Sheva with Plonsk, Riga, Odessa. Not a single Jew remains there. The furnaces of the Nazi dictator and his emissaries brought calamity to the world and a holocaust onto my people. Holocaust deniers negate the deeds of their predecessors so as to cover their own crimes. The falsehood of negation will not extinguish the fire of the inferno. The piles of tortured bodies, the wounded thrown into the ditches of death, the furnaces burning the living. These are our witnesses for ever. The last breath of the infants in their mothers’ arms will continue to horrify all human beings, until the end of time. I was born in Wieszniev. Half of the townspeople came to Israel. The other half perished. After the war, I learned that on Sunday August 30th, a dark dawn had come upon my hometown. The Nazis who had seized it ordered the Jews to pack their belongings and present themselves at their doorsteps. The SS officers passed by striking them and told them to proceed towards the synagogue. One of them cried out “Jews, save yourselves!” The Germans shot down those who tried to escape. The rest reached the synagogue which was made of wood. The doors were locked. All were burned alive. That was the last day of Rabbi Zvi Meltzer, my grandfather, my mentor. He was consumed by fire with his Tallit on his head. That was the last Jewish day in Wieszniev. Not even a single Jew remained alive. I visited Wieszniev after the war. Not a Jewish mark remains. Not a house, not a synagogue, not a school, not a cemetery, only a heap of stones. As I stood there, the last Kol Nidrei prayer emitted by my grandfather’s sweet voice rang in my ears. My lips murmured the Kadish. Tonight many holocaust survivors are present, along with the children of those villages who built the new Israel. The Nazis created industries of death, assembly lines of murder, choking gas plants. No such thing has ever happened in history. So organized, so systematic, so inhumane. It happened in Europe, the epitome of enlightenment. It originated in Germany which claimed to be the spearhead in culture. But it was all vain. The Jews in Germany improved its culture, elevated its scientific level, enriched its economy , like all of Europe’s’ Jewry. Why did Hitler identify them as his greatest enemy? The answer is clear- the moral strength of the Jews was more dangerous to him than the military menace of his neighbors. The Nazis feared that the Jewish conviction that all men are born in the image of God would damage the fascist lie according to which there is a superior race. They feared the prophetic vision may dent the Nazi sword. I am proud to be an arch enemy to the Nazi evil. I am proud of our fathers’ legacy being absolutely opposed to racism. I am proud of our belief that there is no one Man superior to another Man. There is no superior race, only deep roots. I am certain that this is how our children and grandchildren will be brought up; as the Kadish is on their lips, “Love your neighbor as yourself” is in their hearts. My friends, a million and a half Israeli citizens are not Jewish. We are obligated to make sure that none of them are ever discriminated because of their nationality or religion. This is the essence of the existence of the State of Israel. Israel is a defense shield, a safe haven and a great spirit. Had the State of Israel existed during those days, I am convinced that things would have been different. We have paid a high price but we have not lost faith. We have gathered unusual capacities which emerged from the depths of the Holocaust and from the peaks of our legacy. We have a commitment towards the betterment of the world and respect for humanity. The strengths of our nation is concealed in its history and contained in the souls of its sons. We used to be a question mark, now we are a strong country. Today humanity has no choice, we must learn from the lessons of the Holocaust and stand strong against existential threats before it is too late. Iran is at the heart of this threat. She is the center of terror, she represents a threat to world peace. There is no reason to undermine Israel’s capacities to face this threat, whether visible or hidden. We have engendered a young generation with wide shoulders to carry the load. They are more than capable of leading Israel to its historic destiny following the Ten Commandments, Yavneh and its Sages, and Isaiah’s prophecy. We will say Kadish in memory of our brothers, sisters, parents and children who were killed in martyrdom. And we will ensure our children remain Jewish, body and soul, as they carry the load of Israel’s security and the peace of the Jewish Nation is on their shoulders. We came today to say Kadish in memory of our beloved ones who were killed in the Holocaust. We came to say and to swear “Never again”. We came to say that we are a peaceful people who can defend itself. We have built and we shall build. We will always remember our 6 million brothers who perished in the Holocaust.